In the merry town of Roboburg there's a annual fair that the entire population looks forward to with great anticipation, a joyful event that lasts for six days. Because the robots of Roboburg work relentlessly for the whole year in stinky steam factories, and when the fair comes they want to have fun! And to do so, they are willing to spend all the money they painstakingly gained with the oil of their clamps. A lot of traveling carnivals go to Roboburg for the fair, ready to satisfy the townsfolks' need for fun, but most of all, in a purely carnivalesque fashion, to earn as much money as they can in the process! 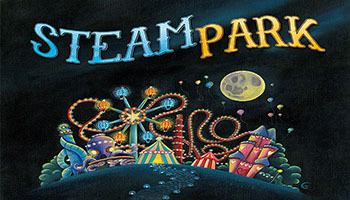 You will be the owner of one of these fantastic steam parks. You'll be assigned a vast area near Roboburg where you'll build gigantic, coal- owered Rides to attract as many Visitors as you can... but beware, Roboburg has a very strict environmental regulation: when you leave, the area will have to be as clean as it was when you first came, so you'll need to keep the Dirt your Park produces under strict control, or the fee could be very harsh! All your hard work will have a single purpose: to earn as much money as you can so you can show up your opponents! 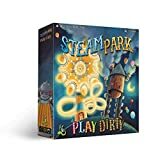 Steam Park is an easy-to-learn game, with two dif ficulty levels : an easier one for less experienced gamers, and a more strategic one for those who want a more exciting challenge. In this management game, you'll have to build your own amusement park and make it the largest and most profitable in the region. By constructing the three-dimensional rides, illustrated by the talented Marie Cardouat, you will see your park grow right before your eyes. Choose your strategy! Attract Visitors, built Toilets to keep the Dirt under control and expand your Park. Whichever approach you take, do it quickly: the less time you spend planning, the more time you'll have to maintain your Park, because - thanks to the action-choosing mechanism - you will need to be not only the best, but also the fastest, if you want to win at Steam Park!